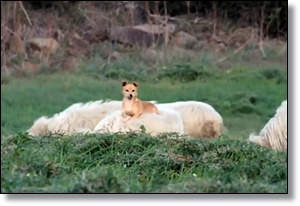 This Dog Was Suppose To Be Guarding The Sheep: He Had Other Ideas! This dog’s owners could not stop laughing when they went to check in on him during his “work hours.” He was suppose to be guarding the sheep, but he had other ideas! Many dogs perform important jobs. Some sniff out bombs while others guide the blind. Dogs are invaluable when it comes to many things humans depend on. This dog takes his position very seriously. He is doing a great job when it comes to bonding with the staff. In fact, his bonding skills are so strong, his employee relationships have reached a whole new level. I think he would ACE those employee trust exercises “fur” sure! This hilarious encounter takes place in Italy where herds of sheep are guarded by all types of dogs. Even this type!